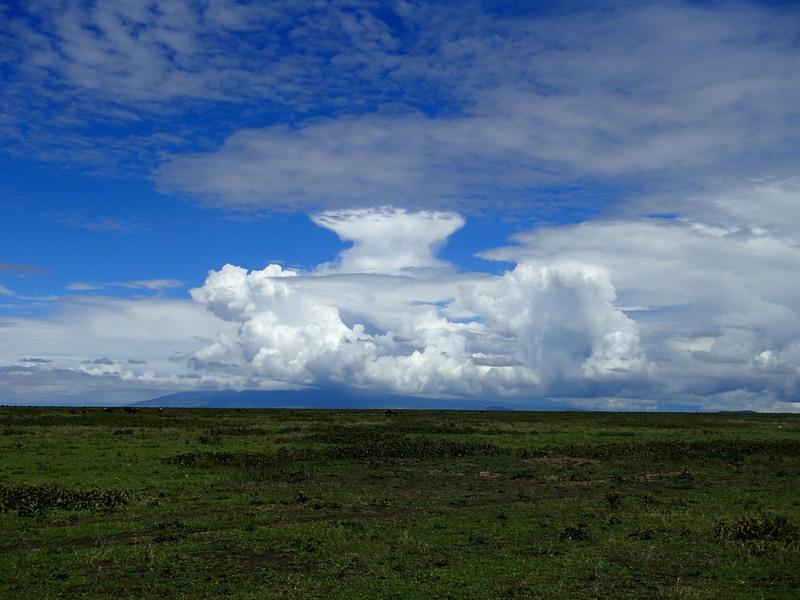 Wide open plains, fields of wildflowers, and beautiful vistas abound in the Serengeti. In addition to seeing diverse wildlife and lots of wildebeests, we also hiked and learned about the Massai culture. 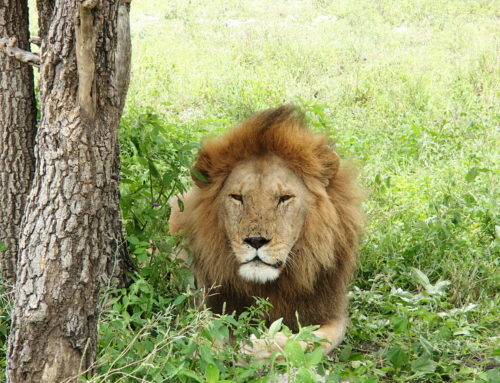 Our first stop in Africa was Tanzania for a four-day safari in a remote area of the Serengeti. We had a pleasant surprise in that it was one month after the wildebeest and zebra birthing season, so we saw lots of babies romping with their moms. 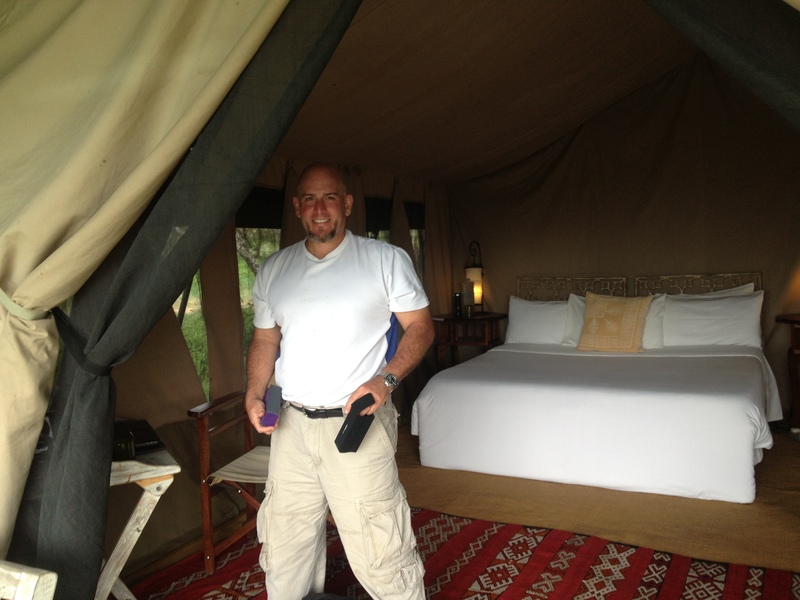 Our base was a tented camp with nearly all the comforts of home. Fly from Singapore to Johannesburg. 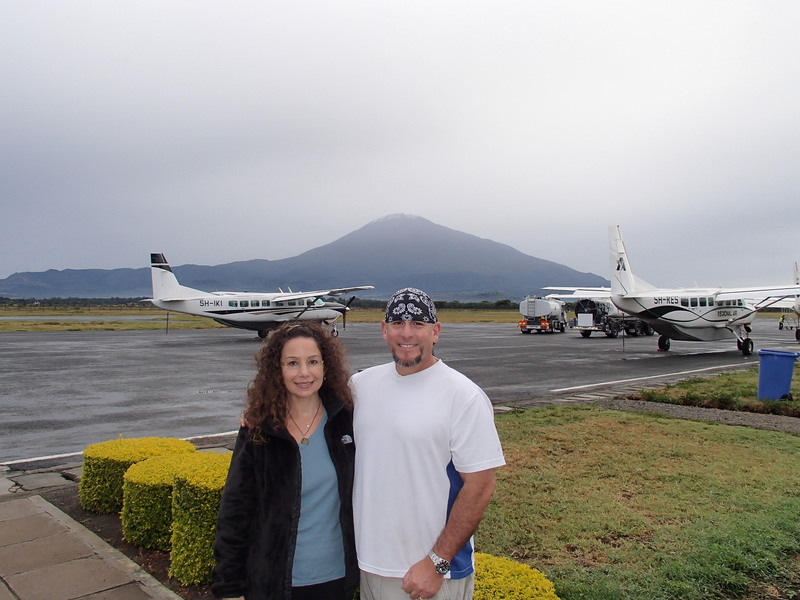 During the four -hour layover, we changed luggage to meet the small aircraft weight restrictions (see Travel Tips). Before the Singapore flight, we packed what we would need in soft duffle bags and put them inside the large suitcases. In Johannesburg, we pulled them out and stored the large bags at the airport storage facility. Since we would not return to Johannesburg for three weeks (after Tanzania, we go directly to Uganda), we would need to live off the limited clothing for a while. Fly from Johannesburg to Kilimanjaro with a connection in Nairobi, Kenya. The flight from Kenya departed early and arrived 30 minutes ahead of schedule (how often does that happen). It was night time at a small airport and we had to wait for the hotel’s driver to arrive. Overnight in Arusha after a 45-minute drive to the hotel. Due to the nighttime arrival in Tanzania, it would be too late to catch a flight to the Serengeti, so it was necessary to stay overnight. The room at Onsea House was really large – living room, kitchen, bedroom, and balcony and valley view. We wished we had planned two nights there so we could enjoy it instead of just passing through. Arusha to Ndutu air strip with a stop at Lake Manyara. After an early morning departure and 30 minute drive to Arusha airport we boarded a small plane with one other couple and a few pilots who got off at Lake Manyara. The takeoff from Lake Manyara was incredible – there was a dramatic drop off a tall series of green hilly mountains surrounded by clouds. Arrival at Ndutu! Our guide, Masha, and spotter, Zerah, were waiting at the air strip and off we went on a game drive and stop for lunch before the two-hour drive to camp. 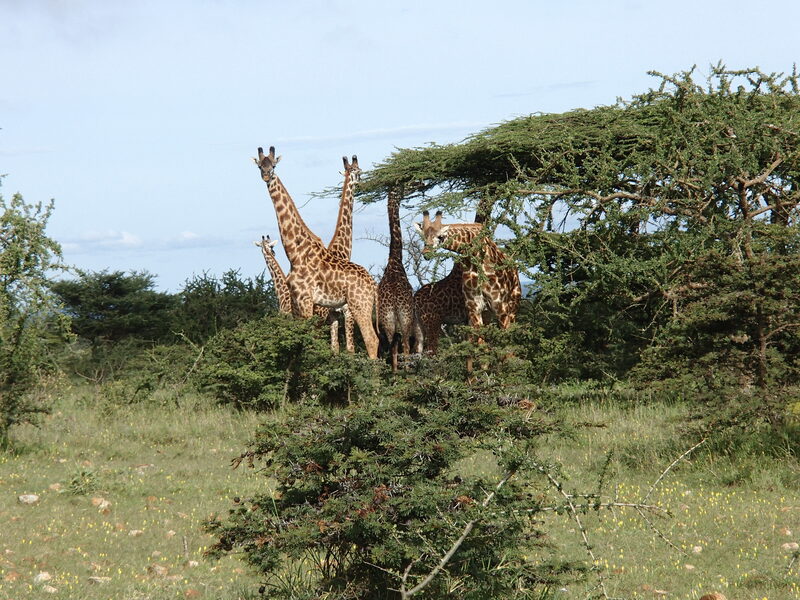 Within five minutes of setting out, we were greeted by several magnificent giraffe. Serengeti has diverse terrain that ranges from endless open plains to forested areas with fields of yellow and purple wildflowers to hilltops with sweeping vistas. This makes for a lot of variety on the game drives. On the plains, we saw more wildebeest than we could count, although this was not the migration season, along with small groups of zebra. Some rested in the road and jumped up when we approached, others darted across the road in front of the vehicle, giving a whole new meaning to defensive driving. On some drives, we ventured far from camp and others we stayed close by. On most days, except one, it was easy find the animals. Some of the most memorable sights were the mama cheetah and cubs, chameleon, and young male elephant. 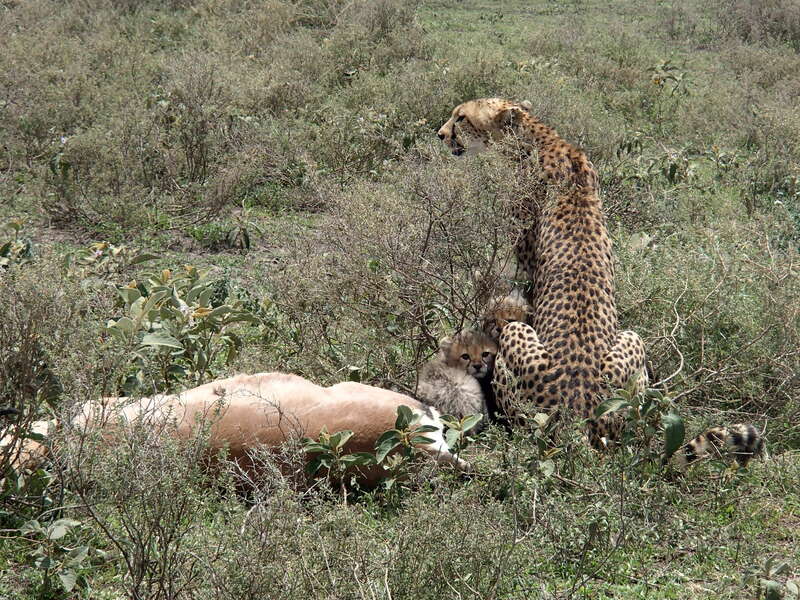 In an open plain, there was a mama cheetah with three tiny cubs, sitting next to a recent kill (gazelle). The cubs stayed close to mom and at one point crawled under her front legs and peeked out. All of the wildebeests stood their distance but watched the group. 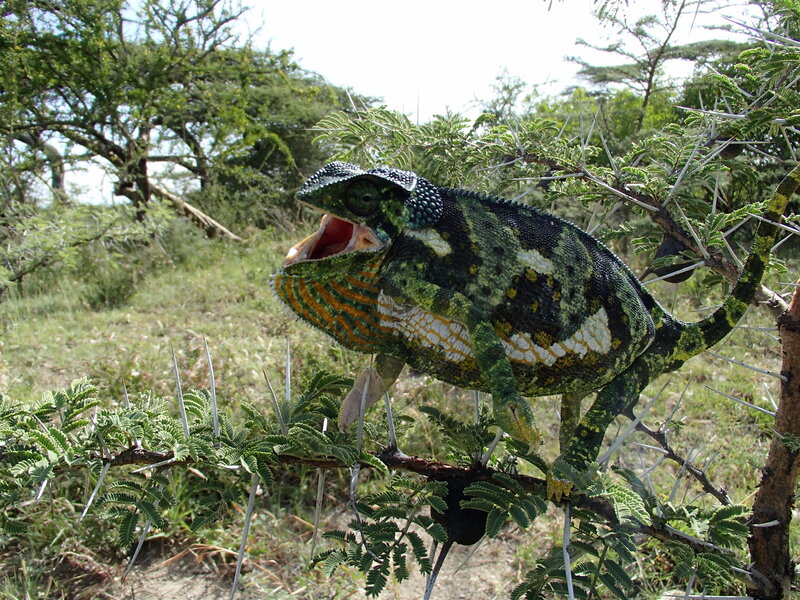 Who would have thought that in a location with large, magnificent beasts, one of the most interesting sights was a small chameleon. As we headed back to camp at the end of a drive, we suddenly stopped short. 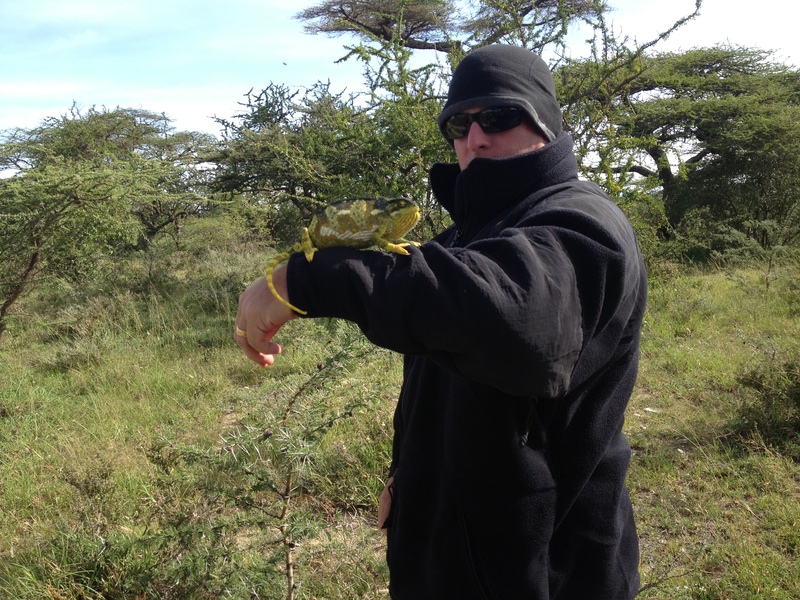 On the side of the road, a bright yellow chameleon climbed into a small acacia bush. We got out and walked over and then she started to change to different shades of green. Michael gently picked her up and placed her on his outstretched arm, and then she adopted shades of black (he was wearing a black jacket). The pattern reminded me of the beadwork on Massai bracelets. He put her back in the bush and we watched her for a while as she adopted many different colors. After meeting sweet Asian elephants in Thailand, we were eager to compare them to the larger African counterparts. It took a lot of searching and a crossing over a small steep river bank to find a striking young male. He did not like us in his territory and made it known with posturing and what appeared to be a charge. As Michael filmed and the guides laughed at Lori’s fear, she envisioned seeing the video on the Travel Channel show, When Vacations Attack. Here’s a full rundown of all the wildlife we saw: wildebeest, giraffe, gazelle, mongoose, large family of baboons, dikdik, antelope, zebra, cheetah, lions, one elephant, one cape buffalo, one hyena, tortoise, dung beetles, cobra, and bright colorful birds (ostrich, vultures, guinea fowl, bustard, blacksmith, hornbill). We also saw some cool skulls and bones from deceased animals. One morning, we set out early for a three-hour hike near camp with our guide and two Massai. We didn’t see any animals, except a baby tortoise, but there were zebra and warthog tracks and dung from giraffe and dik dik. On the hike, we learned a lot about the local flora. The Massai use many of the trees and plants for food and medicine. There is sour plumb (to eat), aloe, mint (for tea), bush with yellow fruit that we forgot the name (for upset stomach), acacia (the bark is used to make soup for pregnant women for energy). Nyuki was excited to find honey from hypotrigona bees (stingless) in two of the trees, which he chopped out with a machete and shared. We had a taste and gave the rest to him. On the top of a hill we took a break and had a snack. Then the Massai showed us how they use sticks to make fire. Michael was very eager to try it later back at camp. 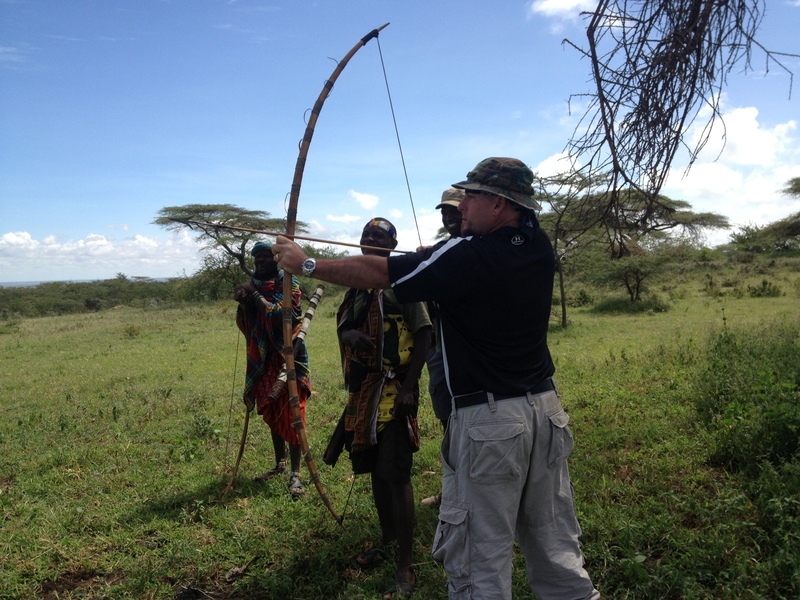 They also demonstrated how to shoot the bow and arrow. Michael gave it a go and almost hit the target. 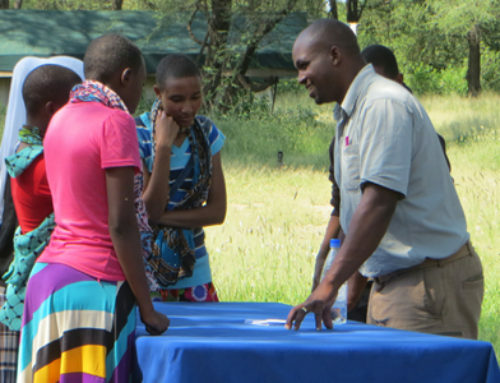 Some of the Massai who work at the camp graciously allow guests to visit their home and learn about their lifestyle. The traditional home consists of a central area for the cows and goats (in separate pens) surrounded by small bomas – one for each wife. Then, everything is surrounded by a tall fence of whistling acacia branches (they have lots of thorns). 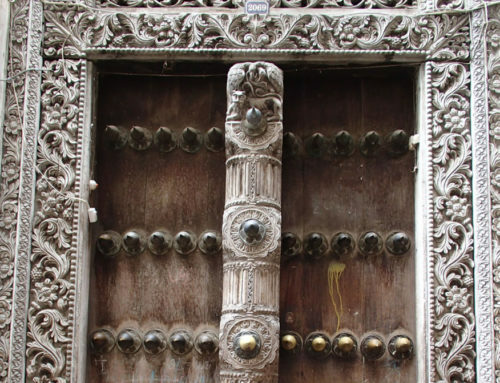 The bomas are made from dung – there is small doorway and no windows. Inside, there is a bench and bed made from sticks and a small fire. The bed is covered with an animal skin. The bomas do not have power or water. The families go to the nearby river each day to bathe and get water. 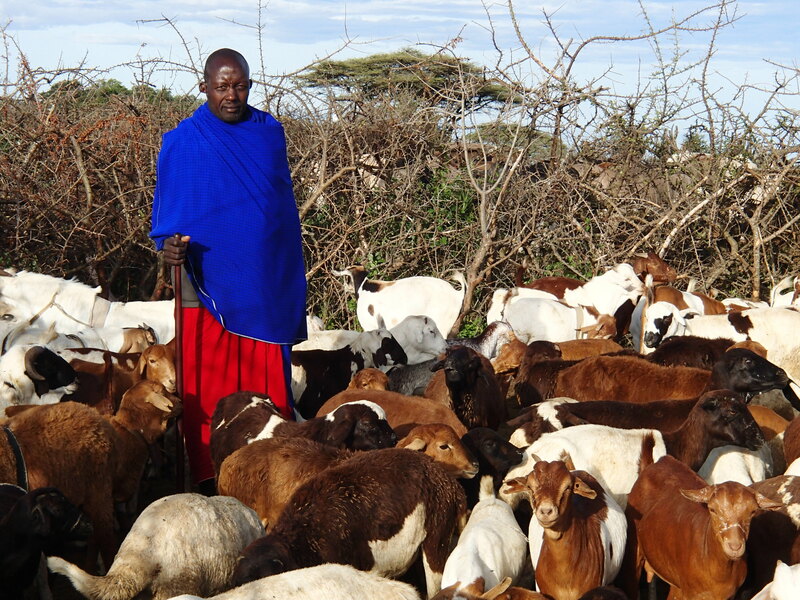 A Massai family’s assets are its livestock – cows and goats. They are semi nomadic and move twice a year to coincide with the wildebeest migration because they carry a disease that kills the cattle. 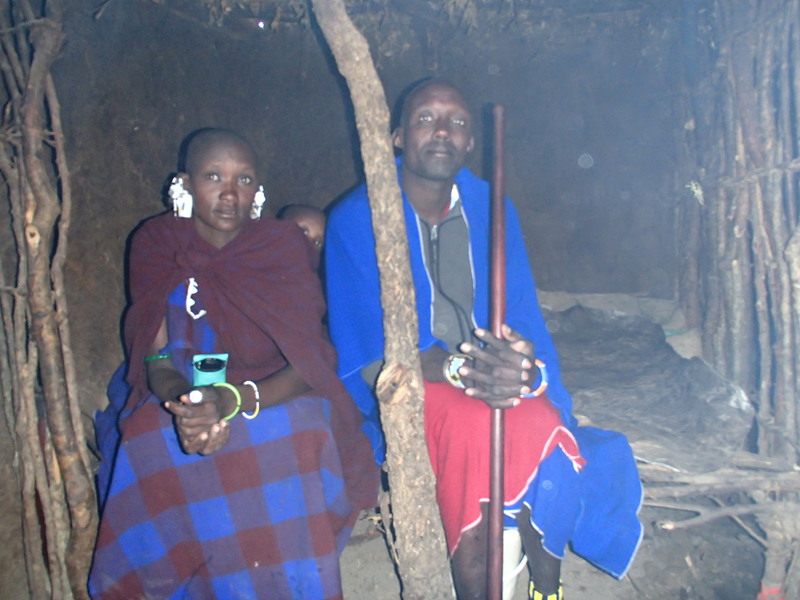 The Massai’s diet consists of milk, yogurt, and meat. It is traditional for men to have multiple wives and many children (children care for the parents when they get old). Marriage is arranged when girls are 12 years old. There are several families that live near the camp. We saw men overseeing their grazing livestock and children playing outside the bomas. 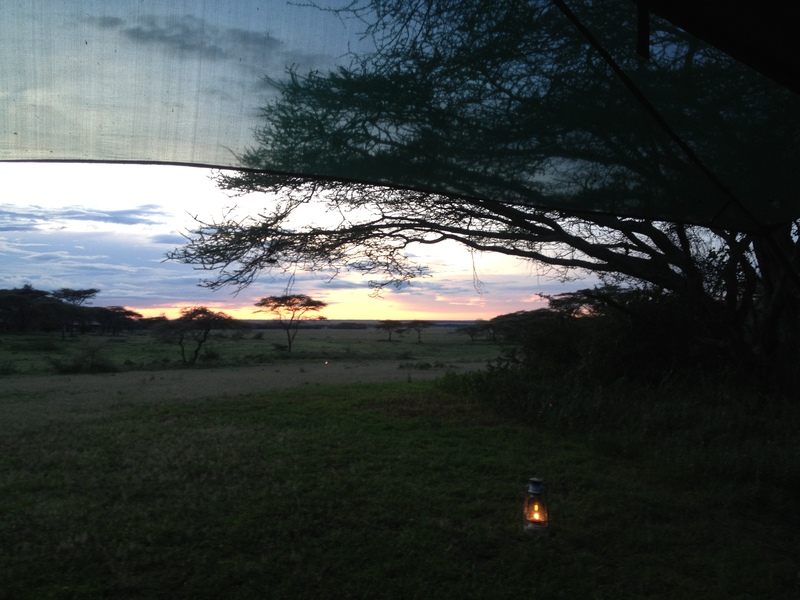 This was our second safari; the first was at a permanent camp in Kruger, South Africa. It is an incredible experience to stay in a truly wild place and observe nature up close. On two of the nights we heard lions in the distance (although they sounded a bit too close for comfort). The camp where we stayed, Serian, was intimate and comfortable. During our visit, only one other tent was occupied by a family from New York (Glen, Mary Anne, and Kate) and we had a really nice time talking with them each night at dinner. Oh, Michael did get a chance to test his fire-making skills and was successful on his first try – but he got some big blisters. Tour Operator: We booked the safari lodge, Tanzania flights, ground transfers, and Zanzibar hotels through Tanzania Odyssey. Everything went as planned with no problems. We received a hard copy itinerary in the mail a few weeks before the trip with confirmation numbers, airline eticket numbers, and local contact phone numbers. (Note: on some of the smaller flights like Arusha to Serengeti, there was no confirmation or eticket number; you just go to the airport and give your name.) The ground transfers were especially useful; it was nice not have to worry about getting to and from the hotels and airport. When to go: If you have any particular interests like seeing the migration or new babies, research which months are best to visit. Also consider the weather conditions (Africa seasons are opposite of North America). When we were there, mid-March, it was very comfortable – cool in the mornings and evenings (light jacket) and warm during the day (but not too hot). Visas: Check with the Tanzania embassy to determine the current visa and vaccine requirements for your country. At the time we traveled, Americans were required to get a visa. We got it in advance, but it was also possible to get it upon arrival. We also had to show proof of yellow fever vaccination. Where to stay: Take a lot of time to research accommodations to ensure you pick the right option for you. Options range from hotel-style lodges with amenities like a pool to tented camps in the wild. Health: Speak with your doctor about health precautions. You may need to have yellow fever and other vaccinations and take malaria pills during your trip. Luggage: You will most likely fly to a small airport or airstrip on a little airplane. The airlines typically have strict weight restrictions for luggage. On our flight, the limit for all luggage (checked and carry on) was 15 kilograms per person. Note: at the Arusha airport, the staff weighed our check in baggage, but not the carry ons, which was good because Michael way exceeded the limit. We also saw people with large suitcases (although they may have been light). If you will be traveling for a while and need more stuff, fly through Johannesburg and store the large bags at the secure storage in the international terminal (Terminal A). Note: there are no signs for the storage facility in the airport, just head down to the basement parking garage (parkade) and you will find it near the elevator / escalator. For duffle bags, we got light weight, folding bags from ebags and they worked out great. Clothing: Bring clothes to layer like short sleeve, light-weight shirts , warm zipper hoodies, comfortable pants for sitting in a vehicle for several hours, shorts, and a hat. Sunscreen: Even if it doesn’t seem hot or your vehicle has a roof, wear sunscreen! Currency: The currency in Tanzania is the Shilling; but most places also accepted U.S. dollars. Game drives: Although you are sitting in a vehicle, game drives can be tiring because you are bouncing around off road and getting dirty. That’s why it is nice to take a long afternoon nap afterwards at camp. There are no toilets when you are out and about, so bring tissue and hand wipes in case you have to use the ‘bush toilet’.